The Furman Institute of Running and Scientific Training (known as FIRST) is dedicated to make running more accessible and limit overtraining and burnout while producing faster race times. FIRST is one of the foremost experts in the world on the science of running; its authority is unmatched and the promise of training less and accomplishing more has made the first two editions of Run Less, Run Faster a solid and steady seller. 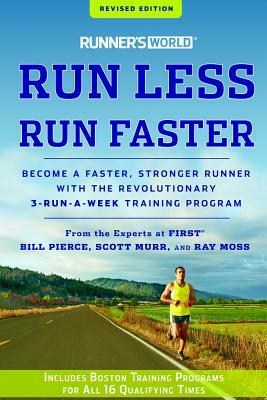 With 50 percent updated content, this new edition of Runner's World Run Less, Run Faster by Bill Pierce, Scott Murr, and Ray Moss continues to promise the same tantalizing results: Readers can get stronger, faster, and better by training less. It will also include more sections for novice runners, broadening the audience appeal, as well as training plans tailored to the new qualifying times for the Boston Marathon. The quality-over-quantity approach optimizes training time and yields better performance—results runners will love no matter what distance they are racing. Bill Pierce, listed as a marathon supercoach by Runner's World magazine, is an experienced marathoner and chair of the Health Sciences Department at Furman University. Scott Murr, an experienced marathoner and 12-time Ironman Triathlon finisher, is director of the Furman Fitness and Aquatics Center. Ray Moss is professor of Health Sciences and director of the Molnar Human Performance Laboratory at Furman University.